Rossland’s Bella Beharrell received news this month that she will be competing at the 2015 Canada Winter Games. Rossland’s Bella Beharrell received news this month that she will be competing at the 2015 Canada Winter Games. Beharrell has earned herself a position on the B.C. Women’s Slope Style Snowboarding team. It was B.C. snowboard team coach Dane Kaechele that broke the news to Beharrell over a surprise phone call. “I’m excited to be part of the B.C. team,” the competitor enthused. The nineteen year old moved to Rossland in 2011 “to be closer to the mountain and get more time on the hill,” the competitor, originating from Nanaimo, B.C. said. Enrolling in Red Mountain Academy was a decision Beharrell is thankful for. It was here in Rossland, “guided by coach Scott Reynolds of the Kootenay Riders, that she rode competitively in grades 11, 12 and also last year while attending Selkirk college,” says supporter Nicole Tigchelaar. Her recent results include second place in a 2013 Provincial competition and third place in 2012. 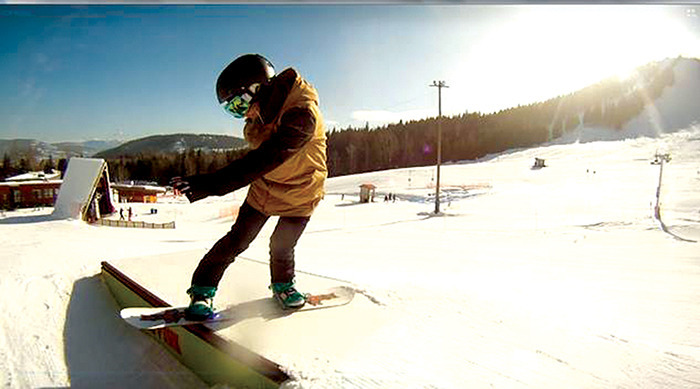 Also in 2012, she placed nineteenth in the all-ages World Snowboard Tour competition. The young athlete aims to be in the park training as soon as possible. The competitor explains she has been cross country training in the meantime, mixing it up between mountain biking and Nordic skiing. “I’ve been out cross country skiing today,” she said of her training regime. Beharrell will be competing against strong contesters who have already begun training at elite facilities such as Calgary Olympic Park and in Colorado and Whistler. Like the rest of the community, the athlete has to wait for the terrain park at Red Mountain Resort to open. She is hoping for a good season and an early opening date so she can begin her intense training. “It is nice to have training facilities close by for our local athlete who will be attending this prestigious event,” explained Tigchelaar. Beharrell has been riding since she was 14 years old and is now sponsored by RossVegas Boardshop here in Rossland. Beharrell would like to dedicate her time to snowboarding but also has an interest in gaining qualifications in geographical information science; a career she envisages is flexible enough to allow time for riding the mountain. The Canada Games are a national multi-sport competition with participation from every province and territory in Canada. The 2015 Canada Winter Games will be held in Prince George bringing together approximately 3,300 athletes, coaches, and managers to compete in 19 sports. The Games are held every two years, alternating between winter and summer and are a key step in developing Canada’s amateur athletes. Snowboarding competitions including slope style have been in the Canada Winter Games since 2007. In 2015 snowboarding competition events will be held at Purden Ski Resort, 45 minutes east of Prince Gorge, and Tabor Mountain Ski Resort, 15 minutes east of Prince George. “Slope Style, involves going down a course doing jumps, rails and tricks. The slope style venue consists of a variety of features and components. The jumps include tabletops, step-downs and a quarter pipe. While the rail features include rail and box slides,” Tigchelaar explained.